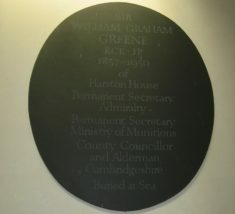 William Graham Greene was born at Takeley, Essex, on 16 January 1857, the eldest son of William Greene and Charlotte. He was educated at Cheltenham College and in Germany. As his father was called William he was known as Graham Greene, not to be confused though with his author nephew. In 1899 he was appointed CB and in 1902 he was promoted principal clerk. 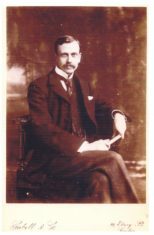 In 1907 he became assistant secretary of the Admiralty and in 1911 was promoted KCB and appointed permanent secretary. At the start of World War 1, Winston Churchill made him one of the war staff group which settled all important matters. Greene was noted for his vast experience and great capacity for work, sometimes staying at the Admiralty until the early hours of the morning. He left the Admiralty in August 1917 and became Churchill’s secretary of the Ministry of Munitions. From 1920-40 Greene began work on a number of sub-committees dealing with statistics, munitions and the use of national manpower. He also wrote a number of unpublished memoranda containing acute observations of leading men with whom he had worked. He was able to do much of this work from home. In retirement he soon became fully engaged in local activities. He was a Justice of the Peace of London and JP, county councillor and alderman for Cambridgeshire. He was until 1948 treasurer of the Navy Records Society which he had helped to found in 1893. After the death of his father, W Graham Greene had moved his widowed mother and sisters from Bedfordshire to Harston where he bought Harston House in 1893. His nephew, the author Graham Greene, when young often visited there for summer holidays. In his book A Sort of Life he wrote: ‘very remote my Uncle Graham seemed, and the more important for his dryness and his taciturnity and the glasses which dangled over his waistcoat on a broad black ribbon’. He also recalled that his uncle avoided being at Harston House when others were there, ‘staying safely away from any family turbulence’ in his bachelor flat off Hanover Square in London. He supported many improvements in the village, enabling the building of a village hall, and providing several public sources of water for its inhabitants. In 1922 he designed the Harston war memorial to honour villagers who died in World War 1 and was closely involved in the design of new council houses that replaced The White Swan Inn after it had burnt down in 1928. He did, in fact, own quite a number of older buildings that bordered the Green, opposite Harston House where he lived, and helped preserve their historical character. Although a man of slight physique, Greene was an active man all his life, fond of hunting and shooting in younger days, and a keen gardener until the end, although his blindness caused issues. The housekeeper at Harston House, E L Gaetyens, recalled in One Will In The House: ‘he would ascend a huge ladder which he had caused to be placed against the house to the third floor, armed with secateurs to trim a creeper. One day after he had unwittingly mutilated a splendid fig tree, his sister sobbed bitterly at the loss, but he was never to know what he had done.’ As a schoolboy in the early 1940s, John Lindgren, Greene’s godson would go down to Harston House occasionally and read to him from the Cambridge Evening news. He wanted read out to him the bits about Harston – in those days there were usually short bits summarising events in each village. He died at Harston House on 10 September 1950 looked after by his two elderly sisters, Helen and Polly (Mary), both in their eighties . His funeral took place at Harston church on 12 September but his ashes were scattered at sea. There is a memorial plaque to him on the wall of the north aisle of the parish church.